You don’t expect your heroes to last forever. In fact you don’t expect them to last very long at all if they’re rock stars playing out their dreams in debauched fashion before your eyes, but Chris Cornell always seemed different. Back in the days of tape trading, we’d procure copies of Screaming Life and Fopp, swap Ultramega OK like nobody’s business and mourn Andrew Wood’s loss with that solitary Temple Of The Dog album on repeat. It was a glorious, if dangerous period in rock music, a genre created in the blink of an eye by people often unable to cope with the pressures fame brought. Drugs were rampant, suicide was worryingly common, but that didn’t stop the emergence of classic album after classic album. Soundgarden more than many of their contemporaries crossed so many genres they had a whole different appeal, paying homage to rock and roll originators as much as they did the punk godfathers and the psychedelia of the 70s, all wrapped up in a grungey malevolence. And with a singer like Chris Cornell they had a stunningly powerful weapon with which to destroy those barriers to the mainstream. I wept as Cornell broke into Hunger Strike during a solo show in 2002. That voice of his sounded more honest with age, giving a personal song so much of a sense of history and importance it was quite simply jaw-dropping. The whole set was so emotional, it still ranks as one of the most captivating I’ve seen to this day. Seeing Soundgarden live in recent years was an incredible experience too. A band with renewed vigour after so long away, it felt as if they’d finally become the group they’d always wanted to be. But here we are; no more Soundgarden. No more Audioslave. No more Temple Of The Dog. Most importantly, no more of that voice. That look. That songwriting ability. Or that beaming smile of a doting father and husband. Although he’s been a musical hero of mine for a good 20-odd years, I must admit I did wonder what to expect from a sit-down solo acoustic show from the former (and current again, for now) lead singer of Soundgarden, Chris Cornell. When tickets were first released though, I knew that I couldn’t afford to miss out on such an opportunity, and I found myself getting pretty excited in the run up to this unique occasion. Taking my seat in the stalls, it wasn’t long before the casually-attired Cornell took to the stage smiling and waving to a rapturously applauding crowd. Sitting down with one of his many guitars, he urbanely introduced the first song as being from “the most successful Bond movie of all time”, and launched into an astonishing You Know My Name, with the track sounding stunningly soulful in such a stripped-down environment. His set continued with a cover of Tom Waits’ House Where Nobody Lives, followed by Scar on the Sky from his second solo outing, Carry On and even so early in the show, the power of his unmistakable voice punched straight through to the upper tier of the huge theatre. Heading into a mini-Audioslave section, Cornell sang Dandelion and Be Yourself ensuring they lost nothing of their majesty in a solo set. In fact, the arrangements of many of the songs he played on this night made them sound as if they could have originally been written for an acoustic arena. A lot of Cornell’s songs from the past two decades have been inspired by tragedy and adversity but the Temple Of The Dog triumvirate of Wooden Jesus, All Night Thing and my personal favourite of the night, Hunger Strike sounded more akin to a celebration of Andrew Wood’s short life than a wake. The big surprise of the night came when Cornell asked the audience who it was he had spoken to earlier who apparently had “Please let me play guitar with you Chris” emblazoned on his shirt. The guy who raised his hand, James Morgan, was acknowledged and, later, beckoned onstage. Cornell asked him what he wanted to play and the pair proceeded to knock out pretty perfect renditions of Doesn’t Remind Me and Fell On Black Days. A great moment and also one hell of an opportunity for James to plug his band Blind Thieves. A particular highlight was when Chris stopped playing and just sang, whilst James continued brilliantly, not realising that Cornell was letting him have an even bigger moment in the limelight. As if the crowd weren’t emotionally invested enough, Cornell proceeded to introduce When I’m Down from his debut solo outing Euphoria Morning by placing a record onto a stage-side turntable. Explaining that the record featured the isolated piano track performed by Natasha Shneider, his collaborator on the album who sadly died from cancer four years ago at only 52 years old, the song sounded more poignant than ever. I Am The Highway, Like A Stone and Wide Awake all brought us back to the Audioslave era and felt so comfortable next to two of his other film soundtrack efforts, Seasons (from Singles) and Sunshower (from Great Expectations), that we could easily excuse the lack of anything from the classic Soundgarden Badmotorfinger LP other than Mind Riot. Although first renowned through his work with the grunge icons, Cornell has spent longer with Audioslave and producing solo work so it’s no surprise that the songs chosen for this night stretched over his full career. Equally, it was great to hear his selection of covers. As well as the aforementioned Waits song, his version of Billie Jean (again from Carry On) is great live, as is his take on Led Zeppelin’s Thank You, and following a colossal Black Hole Sun, the duo of A Day In The Life and Imagine brought the show to a stunning close. 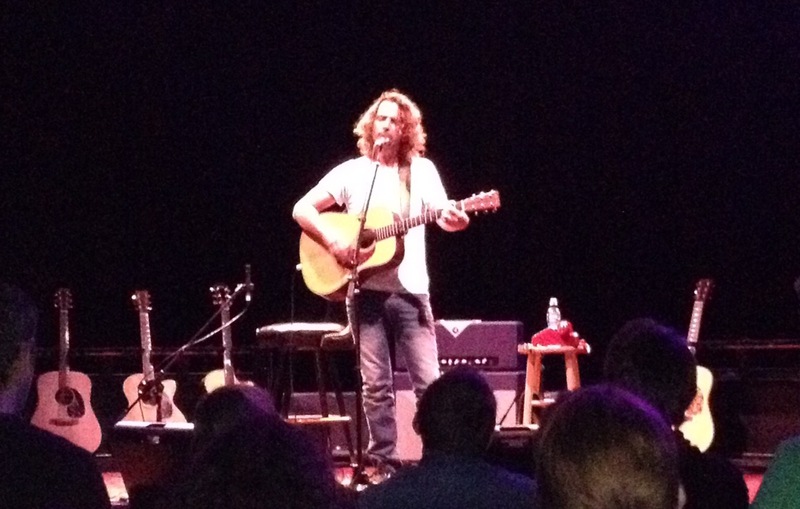 Throughout a curfew-busting 27 songs, Cornell managed to entertain and mesmerize everyone in the intimidating theatre. Maybe he found some Seattle-related synergies with Manchester’s sodden streets, but throughout the show, Cornell really seemed to be enjoying himself, something that initially appears at odds with his mournful lyrics and soulful croon. Songs that are now up to 20 years old sounded so fresh and current that it really highlighted the timeless nature of his songwriting ability and musical output. It was a truly amazing, spellbinding evening and I’m just glad to have had the pleasure of this icon’s company for those few hours. 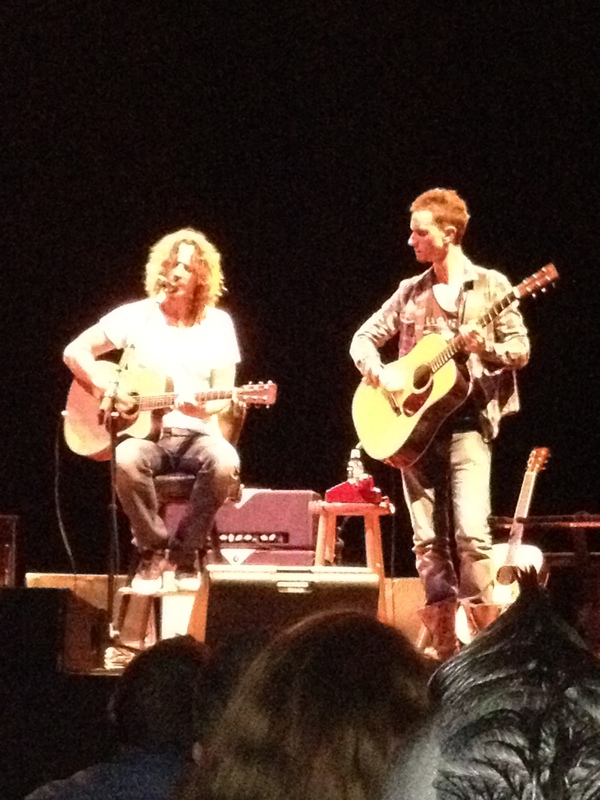 In a month or so, I’m off to see a certain Mr Vedder do something similar; I just hope he knows what he’s up against.